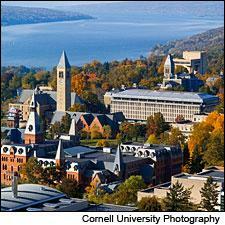 Cornell University has been involved with agriculture since shortly after the Civil War—today, the College of Agriculture and Life Sciences is the third-largest college of its kind in the country. But while the area's farmers have long benefited from the university's expertise, the state's wine industry hasn't been as lucky, until now. True, Cornell has had a grape-breeding program since the late 1800s, which played a pivotal role in the development of hybrid grape species. But it wasn't until recently that the Ivy League institution had a full undergraduate enology and viticulture curriculum. "It's been a long process," said Dr. Ian Merwin, a professor of horticulture who's specialized in tree fruits for most of his 25 years at Cornell before recently adding wine grapegrowing to his résumé. "But now we have the commitment." The new program was given its impetus after the arrival of Dr. Susan Henry, who was hired as the dean of Agriculture and Life Sciences in 2000. Henry and her husband, a wine buff, attended a benefit for Cornell shortly after her hiring where she met several of the area's winemakers, who impressed upon her their desire for a program that could turn out qualified students for New York wineries. "The area wineries were recruiting people trained in California, so not necessarily with cool-climate experience," said Henry. "So we really felt there was an opportunity to fill a niche there." Previously, there was no freestanding undergraduate enology and viticulture program. "Dr. Henry was really the driving force to getting this pulled together," said Merwin, who along with his colleagues helped shape a new curriculum while the university hired three teaching enologists and a viticulturist to staff the burgeoning department, all with the aim of getting a four-year degree program approved by the New York State Education Department. The new program was approved in May 2008, and the university opened a new teaching winery just a few minutes from the main campus in Ithaca, N.Y., in April of last year. While the four-year program is still relatively new and growing, it won't ever be as large as the well-known viticulture and enology department at California's UC Davis. Nor does it want to be. "No one competes with UC Davis," said Merwin. "The New York wine industry is 250 wineries and California is what, 4,000?" Instead, Merwin said the program intends to be elite and competitive—enrollment currently stands at 33 students, with plans to add a dozen or so students each year, eventually maxing out at 60 undergraduate students at one time. "Our curriculum is comprehensive and we intend to be one of the top programs in this country," said Merwin. "Our niche is definitely cool-climate grapegrowing and winemaking. To make good wine in a cool climate like upstate New York's, you probably need to be an even better winemaker than most others." In addition to the new teaching winery, students get to work with a 7-acre teaching vineyard on the eastern side of Cayuga Lake, which was planted to vinifera varieties in 2003. Students also have the benefit of taking internships in the growing wine industry just outside its door. The area's wineries are happily taking note. "I've seen several graduates of the Cornell enology program hit the work force here in the Finger Lakes and I have to say I'm thoroughly impressed," said Peter Bell, head winemaker at Seneca Lake's Fox Run Vineyards. Word seems to be spreading rapidly. Merwin said there have been a steadily increasing number of applications for the program coming from aspiring students across the country, including California, and even as far away as South America. "We're the only Ivy League school with an undergraduate enology and viticulture degree, and also the only school east of the Rockies with this program," said Henry. "And that has a certain panache to it."